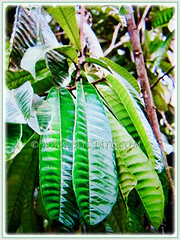 This exotic tropical tree was sited in Sungai Lalang Forest Reserve, Selangor and Setul Forest Reserve, Negeri Sembilan in Peninsular Malaysia. The species has a very restricted distribution with small and fragmented population. Hence, it is listed as critically endangered in the Malaysia Plant Red List. 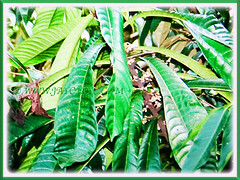 Common Names: Resak Daun Panjang in Malay. The specific epithet yeechongii is named after Chan Yee Chong, a FRIM Research Assistant who collected the specimen and played a vital role in the discovery of the species. Origin: Native to Peninsular Malaysia. 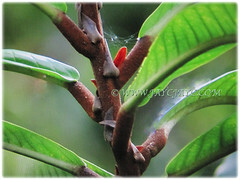 Features: Vatica yeechongii is from the genus Vatica that comprises of 65 species of plants. A medium-sized small and understorey tree that grows between 8-15 m tall and a 9-13 cm diameter trunk. It does not have buttresses. Bark is smooth with horizontal rings and greyish white lichen patches. Its twigs are robust, measuring 1-2 cm in diameter. Young twigs are covered in reddish-brown star-shaped hairs. Stipules narrowly triangular in shape, often curving to one side, 20-35 x 5-8 mm. The thick coriaceous leaves spread horizontally to slightly drooping, bullate above, glossy dark green above while the underside is pale green. 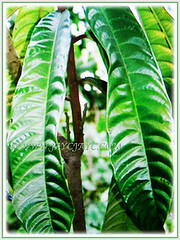 Its large leaf blade is oblong to lanceolate shaped, 44-84 cm long and 10-16.5 cm wide, tapering narrowly to a cordate base. There are 28-30 pairs of secondary veins and reticulate tertiary veins. Domatia may be present between veins joints. Leaves have entire margin, heart-shaped base and acuminate apex. The midrib is very stout and prominent below.Stipules narrowly triangular in shape, often curving to one side, 2-3.5 x 0.5-0.8 cm. Petiole is 2-3 cm long and 0.9-1.3 cm thick, as well as densely covered in reddish brown hairs that appears cracked when dried. 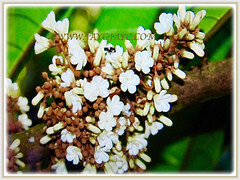 The 5-petalled flower is white to beige in colour. Fruits are found along main rachi on first branches. Fruits develop in a bunch where one fruit occurs at each node. 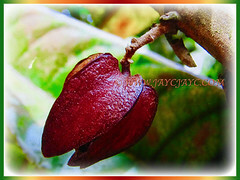 Fruit has 5 ovate calyx lobes, about 3.5-4 cm long and 1-1.5 cm wide. It will turn from green to reddish brown when ripe. The ovoid nut is 1.5-1.8 cm in diameter, glabrescent and completely hidden in but free from the calyx lobes. 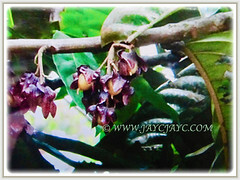 Culture (Care): Vatica yeechongii can be grown easily with least maintenance. Others: Remove brown and withered leaves to keep it tidy and aesthetically pleasing. Once every fortnightly, feed it with a balanced fertiliser for foliage plants.. Generally free from serious pests and diseases. Sorry, there is no information available on growing Vatica yeechongii in the United States of America. Propagation: Easily propagated from seeds. Its germination is epigeal. Usage: Vatica yeechongii will be excellent when grown in public parks and gardens. 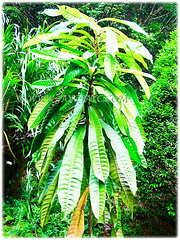 A rare and very exotic tree that will be the envy of your neighbours if planted in your garden. A lovely tree that is suited as an accent plant. 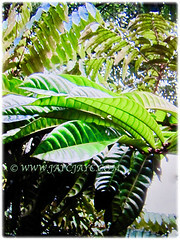 Plant this fabulous beauty in your garden if you desire a tropical theme.